Welcome to Burnt Bottom Unique decor throughout. Great kitchen space for cooking Seating at the bar and table area. Stainless steal appliances Open floor plan. Leads out to the pool/deck area Stay connected with your guest while in the kitchen Living room with large flat screen TV. Sliding glass doors lead out to the pool/deck area King bedroom located on the lower level with private attached bath King bedroom, tv and attached bathroom. Located on lower level of home. King master bedroom with ocean views. Connected bathroom with walk-in shower. Connected bathroom with walk-in shower. King bedroom located on the 2nd floor, with street view. Queen over Queen bunk with Queen trundle, bedroom sleeps 6 guests. Queen over Queen bunk bedroom with flat screen TV. Second floor common area with seating and ocean views. Queen sleeper sofa and lounge area, located on the 2nd floor. Area features flat screen TV and ocean views Bathroom with tub/shower combination Half bathroom located on the first floor. first floor attached bathroom with tub. Relax by the private pool. Pool area with dining table and grill area. Walk out to the beach Deck with private pool leading out to beach walkover. Welcome to paradise. "Burnt Bottom" is a beachfront dream home located on the East End of Panama City Beach. This home features a private heated* pool, direct access to the beach, 6 bedrooms, 6.5 bathrooms, unique beach decor, and is sure to be the perfect spot for your beach getaway. 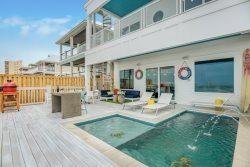 A true gem in Panama City Beach- Burnt Bottom boasts 5-star amenities and amazing unique décor. "Burnt Bottom" has an excellent central location, picture perfect beachfront views, and all the comforts of home! Breathtaking views of the Gulf of Mexico are seen walking through the front door of Burnt Bottom. The main living area is an open living concept, a large living space opens to a dining room and huge full function kitchen, this allows for plenty of family entertainment. Perfection doesn't even begin to describe the outdoor space. The pool deck features an oceanfront pool with color changing pool lights and the option to be heated*, a Kamado Joe Professional charcoal grill, outdoor private shower, and plenty of seating for the whole family to lounge and sunbathe. As if that wasn't enough Burnt Bottom also features a raised walkover that takes you right out to the sugary white sands of Panama City Beach. Also on the first floor is a Queen bedroom with en-suite and a King bedroom with en-suite as well. Additionally, there is a half bathroom and washer/dryer as well. The second level of the beach home, has a loft area for additional sleeping and entertaining. This area has a large flat screen TV and DVD player, perfect for the kids! The loft area provides plenty of sleeping and sitting space with 2 queen-sized sleeper sofas. There is also 2 Queen over Queen bunk bedrooms, one featuring a twin trundle. There are 2 king master bedrooms for you to relax in also on the 2nd floor. The large master suite overlooks the ocean with an additional cozy sitting area. As the other King bedroom has a street view. Burnt Bottom has plenty of space and great design for both a large or small beach vacation. Centrally located- this home is surrounded by wonderful night life, family entertainment and activities, and the gulf's best fine dining. Burnt Bottom is a popular choice for many different events including: weddings, birthday parties, family reunions, and receptions. Holiday beach rentals handled everything for us. The home was more beautiful in person than the photos indicated. Everything was perfect!!!! If you're in the market for a rental house in the Panama City Beach area, look no more. This house is nothing short of perfect. We had a group of 24 students from the University of Arkansas And everyone had plenty of room and couldn't believe how beautiful the house was. Pictures do not do this place justice. Plenty of parking, walking distance to many clubs, restaurants, stores and much more! Cant wait for another opportunity to stay in this house! Do yourself a favor and book this place, you will not be disappointed! My family loved our beach vacation. The home was incredible, our service was amazing. I couldn't have asked for a better vacation. What an amazing view of the Gulf of Mexico. I never wanted to leave. We had our Beach Wedding at this home, and it was perfection!! The home is so amazing, the pool deck is breathtaking, the dcor is so unique. I could not have picked a more magical place to have had our wedding. The beach was beautiful, and the home was large enough to accommodate our wedding party. We will make sure that we return to this dream home every year!!! Thank you Holiday Beach Rentals for making "Our Special Day" that much more memorable! -Doug W.